Tutorials, reviews, case studies and other tips to help website owners and website developers master the Joomla content management system. How Many of These Joomla Websites Have You Visited? As Joomla site designers, it is easy to forget that the tool we all love so much, is itself a labour of love. 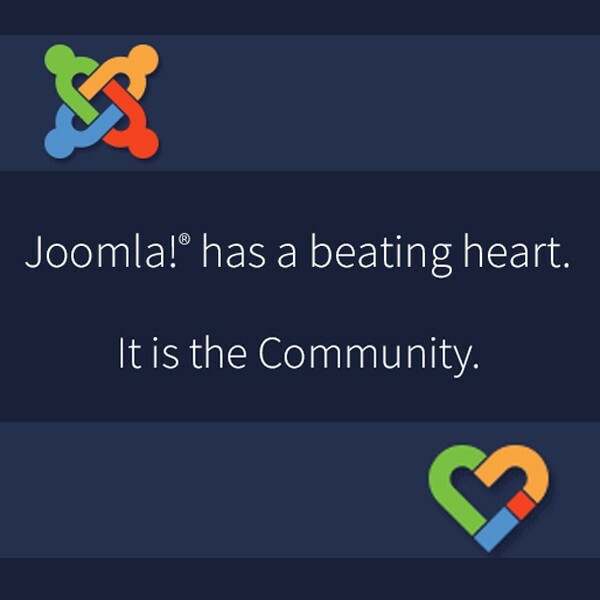 Unlike other large Open Source projects, Joomla is an all-volunteer organization. Without the international community of diverse expertise, passion and commitment, the project would not be a fraction of what it is today. 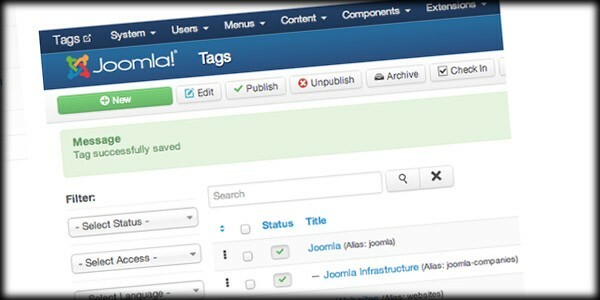 Joomla 3.1 Beta is Released - and We Have Tags! Earlier this month The Joomla! 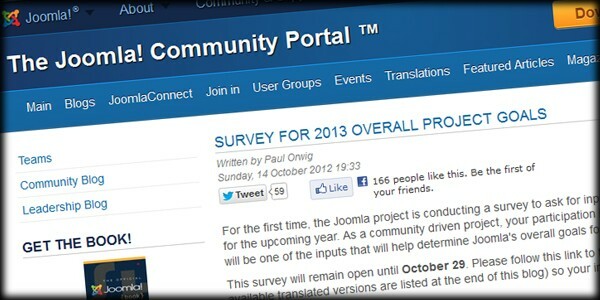 Project released the beta version of Joomla 3.1. This gives the community a great opportunity to see what's in the pipeline for stable releases, and it allows extension developers the opportunity to test their code on the new version. Aside from finding out about this new feature, Tags, the biggest question will no doubt be...Should I upgrade? This past Friday through Sunday, November 16 – 18, saw the first ever Joomla World Conference in San Jose, California. The variety of backgrounds from the group that descended on Silicon Valley in the US was absolutely amazing. There was a different language being spoken in every corner of every room, and sessions were mixed with the highest level Joomla Pros and the freshest of Joomla beginners. It was a great crowd. It was very heartening to know that however deep your Joomla background is, you could benefit and grow from attending this conference. I’m already looking forward to the next event. As The Joomla! Project begins to finalize its goals and strategy for the coming year, they are asking for help and input from the Joomla community. The Project has put together a 16 question survey with questions ranging in subject from how you use Joomla to thoughts on paying contractors and employees. The deadline to participate in this survey is October 29. 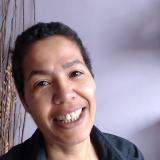 This week the Joomla! Project released a security update for the Joomla 3 series. This update addresses a low priority XSS vulnerability in the Joomla Core as well as introducing a new feature and fixing 47 tracker issues. As version 3.0 of Joomla's CMS hit the streets last week, the anticipation grew, and as Alice Grevet points out in this month's edition of the Joomla! Magazine, "A little buzz happens in the press with every release, but this time it's different." The October edition of the magazine spotlights Joomla 3, and some very important topics within the Joomla world. Joomla 3.0 has been released. Here is my recap along with community reaction. The Joomla! Project has announced the immediate availability of Joomla 3.0.0, which is the latest Short Term Release and the first stable release in the 3.0 series. The new version includes many new features, including the use of Twitter's Bootstrap framework. 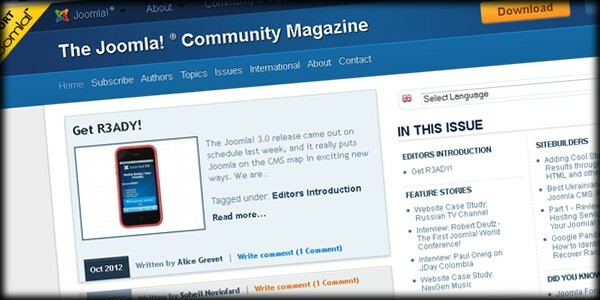 As mentioned in the Editor's Introduction of the publication, this latest issue of the Joomla! Community Magazine, which happens to be their biggest yet, is about getting "Back to Life" and looking forward to what's ahead. Poznan, Poland will host the first Joomla! Day Poland on September 22nd and 23rd, 2012. "It’s an opportunity to share ideas, techniques and knowledge and to meet professionals and members of the Joomla! 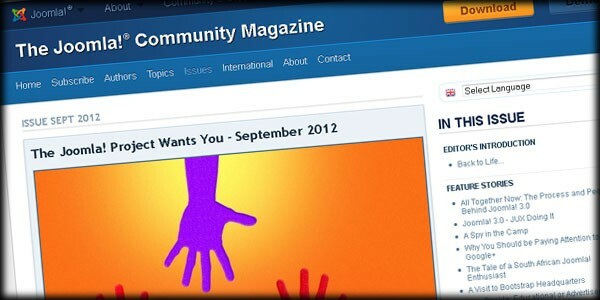 community," writes Gary Brooks on the Joomla! Community Portal website.